You will earn 14,375 Reward Points. Earn 1 reward point for every 1 dollar spent. Tank brush and clean-out rod. 1 1⁄4" port ball type drain valve. Set of four 6" adjustable (2 locking) casters. Twin fry baskets with plastic coated handles. Maintains idle temperature setting with only 4,318 BTU/hr. to save energy. Stainless steel fry tank, 45 - 50 lb. capacity. Includes 10 year limited tank warranty. Energy saving SoftStart™ ignition system extends oil life while requiring lower BTU’s. Energy Efficient ThreePass™ heat transfer system yielding 60.9% cooking efficiency and 72% Thermal Efficiency. ENERGY STAR® certified. 3⁄4" Flexible gas hose with quick disconnect. Set of twin baskets - 6 1⁄2"w x 13 1⁄4"d x 6"h.
Single large basket - 13"w x 13 1⁄4"d x 5 1⁄2"h.
10" high stainless steel removable splash guard. Stainless steel tank cover - doubles as a work surface top. Connecting Kit(s) - Connects two fryers together (brackets, grease strip and hardware included). 45 - 50 lbs. 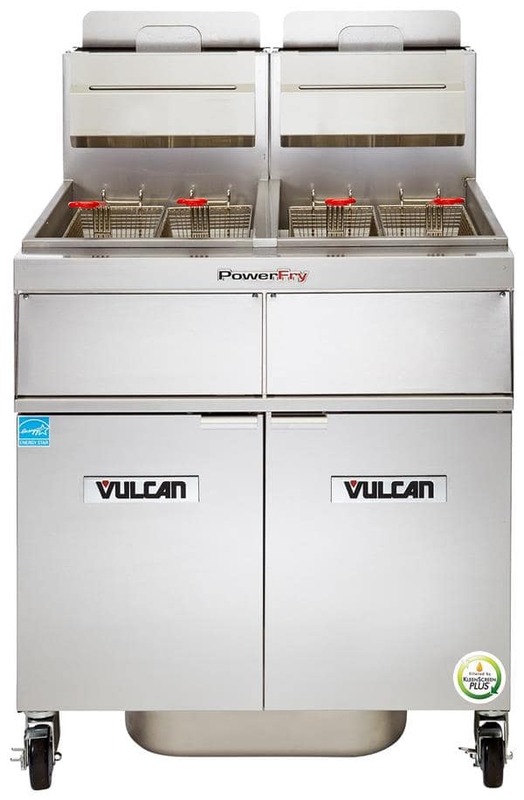 capacity free standing gas fryer, Vulcan Model No. (1TR45A) (1TR45D) (1TR45C). 70,000 BTU/hr. input. Stainless steel cabinet. Set of four 6" adjustable casters (2 locking). Stainless steel fry tank with ThreePass™ heat transfer system. ENERGY STAR® certified. SoftStart™ ignition system using 35,000 BTU/hr. to extend oil life during start up. Idle rate of 4,318 BTU/hr. to maintain cooking temperature. 11⁄4" port ball type drain valve. Twin fry baskets with plastic coated handles. Solid state analog knob control, digital, or programmable computer control systems all standard with electronic matchless ignition. Tank brush and clean-out rod included. CSA design certified. NSF listed.